Going to have to admit something today. I’m a snob; not about money or possessions but about manners. Things like not talking with your mouth full because I really don’t want to see it all going around in there like washing in a tumble dryer and I honestly can’t understand what you are saying through a mouthful of grub. I could probably list two whole blog entries with things I dislike and many of you would agree with me but one that I know drives some of my friends up the wall is “being talked over”. You know the situation. You are sitting with people and in the middle of saying something, an interesting anecdote or stating an opinion when someone driving a verbal steamroller just barges in with their own contribution. It puts the rest of the assembly in a pickle. Do they carry on listening to you or do they (out of politeness) listen to the bargee? That would mean ignoring you which is pretty rude too. I will often stop what I am saying and fix the butter-in with an interested expression, wait til they have finished and smile sweetly. “As I was saying…” before continuing exactly where I left off as if nothing had happened. “How very interesting! Well worth cutting me off to hear.” That is when I’m getting a bit testy. “Really?” (icy tone) I am now getting close to the point of physical violence if it’s the same person for the third time. After this I just sit. I do not take my eyes off the bargee. I do not open my mouth. I listen to the other people talking and may invite the bargee’s comments with a lifted eyebrow but I do not say one word. It gradually sinks in to even the thickest, most ill-mannered git that they have gaffed. I must stress that I have to be pushed to the limits for this last exercise to be put into action. It is much preferable to the high-decibel, air-turning blue request to “STF up” which I am tempted to employ. Sort of agree but sometimes barging can’t be avoided. When someone has talked nonstop for three quarters of an hour and is expressing views not telling a story, sometimes you have to interrupt or just be a permanent listener. That’s true too. I find that when everyone has glazed over or is yawning, butting in is called for! People who are half listening to you while waiting for something more interesting to happen on their phones. PET HATE! Also people who are just plain uncivil – recently a station manager in London refused to help my daughter to the platform with her baby and buggy. There is no lift, so she was forced to walk to the next station. Needless to say, took to Twitter!! YOU couldn’t be boring Ailsa… surely? Oh dear. I have to admit to coming from a family of unwitting bargees in that we all talk at the same time. I remember particularly on my Mum’s side, my grandparents, great aunt and sundry others would come round at Christmas. Everyone would talk at once and I would frequently be carrying on three or four conversations at the same time. Until I was about 20 I thought that’s how conversation with more than one other person worked. I remember when McOther first came home with me and was horrified. “It’s a shouting match,” he said. “But you’re all talking at once. You’re supposed to take it in turns,” he said. “No, we’re talking to each other, we just have several conversations going on simultaneously. It saves time,” I said. Not getting his point, at all. McOther stared in bug-eyed horror, but luckily he married me anyway. 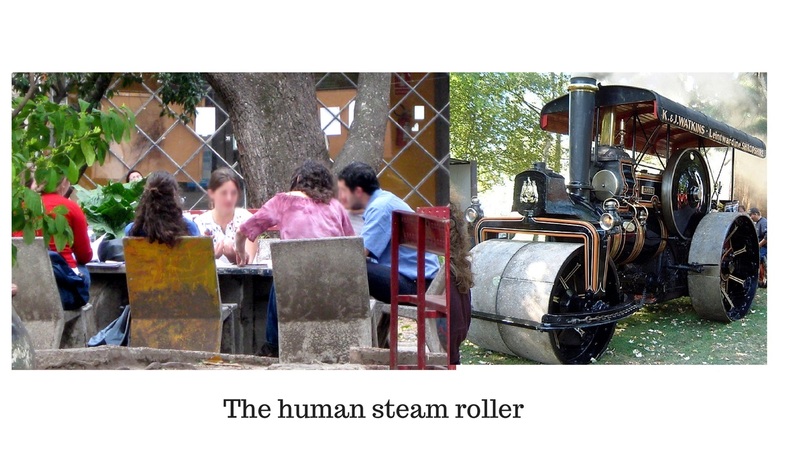 It never occurred to me that there was such a thing as a conversational steamroller until that first, aghast response to a gathering of my family from my husband. Since then I have gradually learned how normal conversation is done but it’s been a hard row and I’m afraid that when I get together with my close rellies we all revert to type. The trick is to know what kind of conversation you’re going into, right? I bet life with you is never dull, colourful and hilarious, but never boring!